I have curly hair. You'd never know it, since I have mastered the blowout and the art of the flat iron. But yes, it's true ... underneath the sleek, shining tresses I so painstakingly work to achieve each day lies a mass of seemingly uncontrollable curls and waves. It would be an understatement when I tell you that these curls are the bane of my existence. They don't look pretty when left to their own devices ... they lie every which way, some corkscrewed, some pulled out ... all, well, less than sightly. So when I had the opportunity to try the new Bumble and bumble Curl Conscious Nourishing Masque, I jumped at the chance to see whether my locks would finally, finally lie flat. For starters, this mask smells fantastic. It's fresh and clean, without any sort of salon-like after-effects. (I love my Kerastase Masquintense, but man, does that stuff smell terrible.) I must say, it's nice to find a mask that actually is pleasant to leave on the hair for ten minutes at a time! The consistency is thick and creamy, and not at all watery. It feels like a rich moisturizing lotion that you would spread on ashy or dry skin. So I spread it all over my hair and waited the requisite ten minutes before rinsing it off. OH ... MY ... GOODNESS. This stuff works. Immediately, my locks were softer, smoother and bouncier. This made my hair so silky, there wasn't even any need for extra conditioner. And trust me when I say I have never experienced that before. When I blow-dried, I noticed more life and luster in my hair, which lasted for days on end! 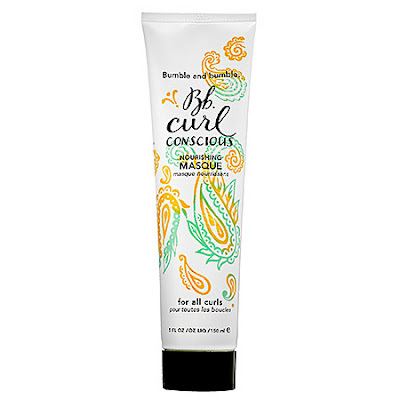 Bumble and bumble Curl Conscious Nourishing Masque retails for $27 at sephora.com. uhh can you please teach me how to master the art of the blowout cuz your hair looks great all the time! !